I always make homemade pâté for the holidays. It’s a great appetizer to serve at a party with charcuterie, as well as a delicious savory addition to a fireside dinner. 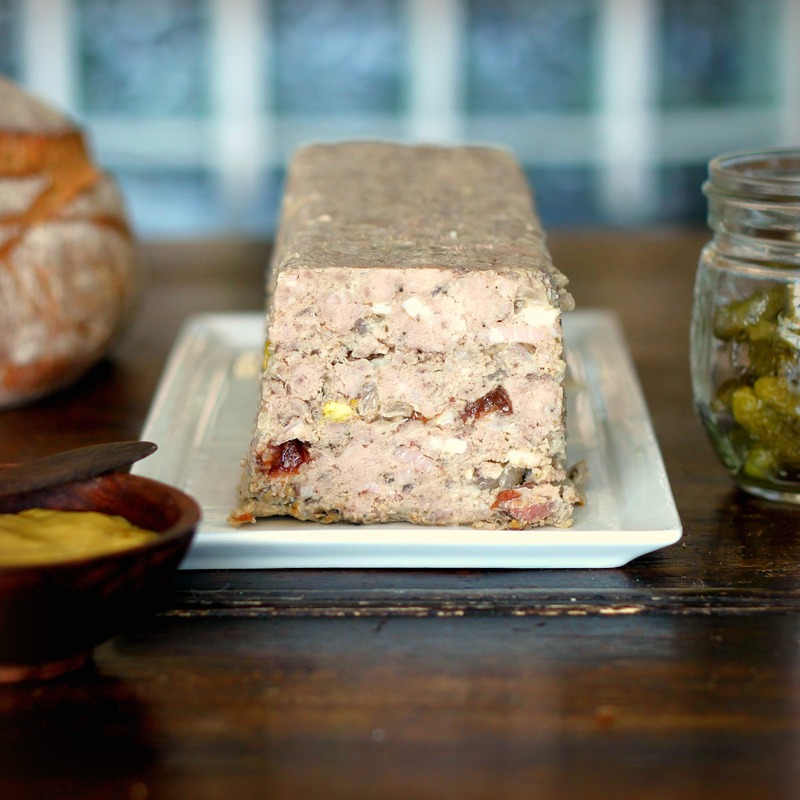 Homemade pâté is surprisingly easy to make and can be prepared well in advance of any festivities. Its method incorporates “packing” – which, in charcuterie terms, involves jamming a terrine mold with ground spiced meat, spirits, eggs, and cream and baking it in a water bath. The resulting baked brick of spiced and fortified meat is weighted down and banished to the refrigerator to sit for a day or two to become comfortable with it’s brash flavorings while anticipation builds – just as it would the day before Christmas as you eye unopened presents placed beneath the tree. When the time is right (2 days at least) the terrine is retrieved from the refrigerator and its wrapping discarded, uncovering a rich, meaty country pâté, chunky with nuts and fruit. I have fiddled with this recipe over the years, and lately become enamored of wild boar. Boar reminds me of Europe, where it’s a frequent ingredient in charcuterie. It may be purchased in specialty stores, through a butcher or mail order. Since it’s so lean, it’s important to combine the boar meat with a fattier cut such as pork shoulder. Alternatively, you can substitute veal for the boar meat. Begin at least two days before serving to allow the flavors to develop. You can either grind your own meat, or simply have your butcher grind the meat for you. 1. If you are grinding your own meat, then cut the boar and pork in 3/4-inch cubes. Place the meat in a large bowl and add the garlic, salt, pepper, thyme, allspice, coriander, and cloves. Mix to thoroughly combine, then cover with plastic wrap and refrigerate for at least 6 hours or overnight. Grind with a meat grinder before proceeding. 2. If you are using ground meat, combine the boar and pork in a large bowl. Add the garlic, salt, pepper, thyme, allspice, coriander, and cloves. Mix to thoroughly combine, then cover and refrigerate for at least 1 hour or up to 24 hours. 3. Preheat the oven to 350°F (180°C) Add the bacon to the meat and return the meat to the refrigerator while you prepare the onions. 4. Melt 2 tablespoons butter in a skillet over medium heat. Add the onion and sauté until translucent but not brown, 4 to 5 minutes. Remove from the heat and cool to room temperature. Add to the meat. 5. Combine the eggs, cream and calvados in a small bowl. Add to the meat and mix well. 6. Butter a loaf pan or terrine. Press one third of the meat into the terrine. Sprinkle half of the pistachios and half of the cranberries evenly over the surface. Press another third of the meat into the terrine. Top with the remaining pistachios and cranberries and cover with the remaining meat. Cover the terrine tightly with foil and prick 2 to 3 holes in the foil. Place the terrine in a baking pan. Pour boiling water into the baking pan halfway up the sides of the terrine. 7. Bake in the oven until a meat thermometer inserted in the center reads 155°F, about 1 1/2 hours.Remove from the oven and remove the terrine from the water bath. 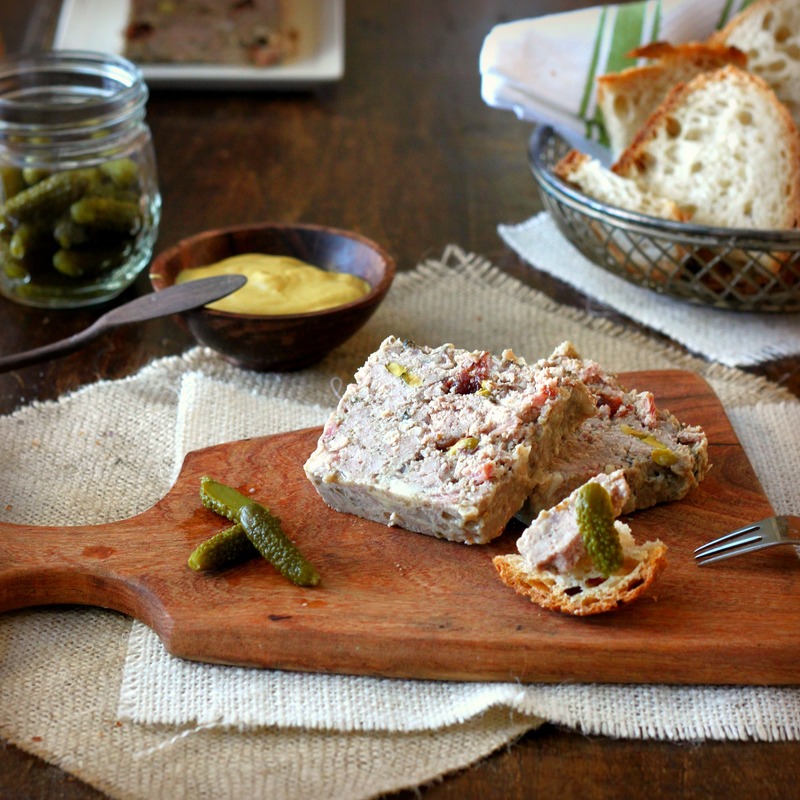 Place a terrine press over the pate (or a cutting board with cans on top) and cool completely. Transfer the weighted terrine to the refrigerator and refrigerate for 1 to 2 days before serving. 8. To serve, un-mold the pate and scrape off any congealed fat. Cut into slices, about ½-inch thick. Garnish with the peppercorns. Serve with cornichons, Dijon-style mustard, and fresh French baguette or country bread. 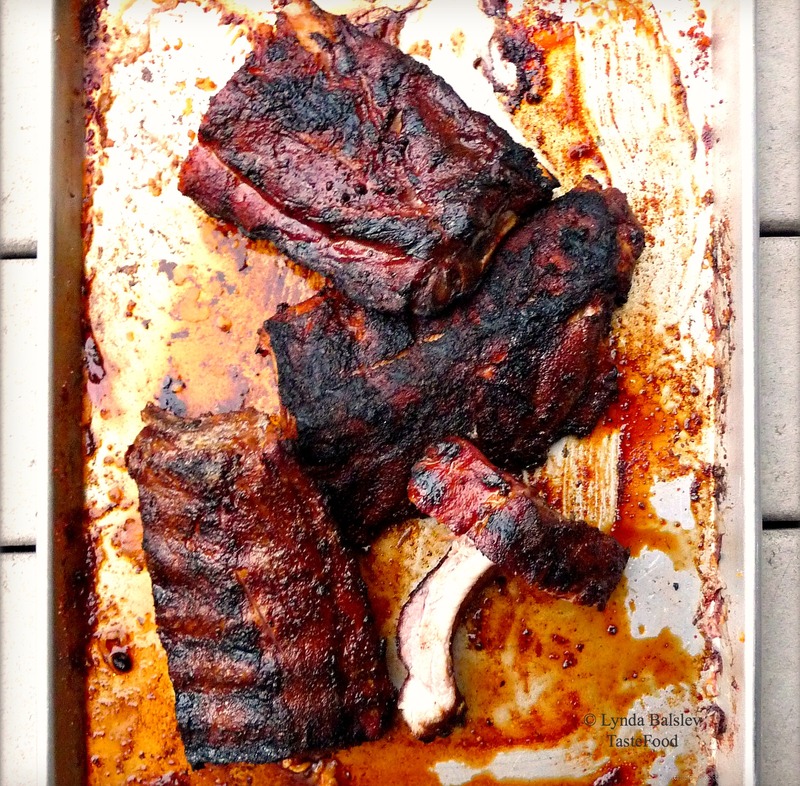 I won’t lie: These ribs take two days to make. Now, before you click away from this page, just hear me out. I promise that if you make these ribs, you will be a very happy cook. Your family will be eternally grateful. Your guests will be impressed. And you will be rewarded with a deeply flavorful, warmly spiced, tender and rich braise. The only people who might not be pleased will be your neighbors, because they will have to live through a day of incredible aromas wafting from your kitchen window, knowing full well they are not coming to dinner. Now if that is not enticing enough, here is some more good news: While it takes two days to make these ribs, most of the time you will have little to do in the food prep department, because the ribs will take care of themselves, braising in the oven or sitting in the refrigerator. You will be actively involved in the beginning, when you brown the meat (a very important step which will make you feel useful), then when you reduce the sauce (which technically your stove will do for you), and then finishing the braise for serving. Your most difficult task will be…waiting. All of the time invested is for good reason: to tenderize the beef to a supple version of itself, and to infuse the meat and sauce with knock-your-socks off flavor. So go ahead and give it a try. Start on a Friday and eat it over the weekend. And feel free to double the amount so you can freeze extras for another day or have a party – it might be a good time to invite the neighbors. If you have the time (and patience) rub the short ribs with the spices the night before browning to develop the flavor. The chipotles in adobo will add a nice kick of heat to the braise. Serves 4 to 6. Combine the dry rub spices in a small bowl. Arrange the ribs on a rimmed baking tray. Rub the spices all over the ribs. Let stand at room temperature for 1 hour (or cover and refrigerate for up to 24 hours.) Remove from the refrigerator 30 minutes before browning. Preheat the oven to 300°F. Heat 2 tablespoons oil in a large Dutch oven over medium-high heat. In batches without crowding the pan, brown the ribs on all sides, about 8 minutes. (This step is very important, so take the time to do it well). Transfer to a plate or bowl and repeat with the remaining ribs. Drain off the fat from the pot. Add 1 tablespoon oil, the onion, carrot, and garlic. Saute the vegetables over medium heat, stirring up any brown bits in the pan, until they begin to soften, about 3 minutes. Add the cumin, paprika, and coriander and cook, stirring, just until fragrant, about 30 seconds, then add the tomato paste and stir to create a nice slurry. Add the wine, chipotles, and bay leaf and return the ribs and any collected juices to the pot. Pour in the beef stock. If the ribs are not completely covered with the liquid, add more stock or wine to top off the ribs. Bring to a boil, then turn off the heat. Cover the pot and transfer to the oven and slow cook until the ribs are very tender, about 3 hours, stirring every hour or so. At least 1 hour before serving, remove the pot from the refrigerator and lift off the layer of fat on the surface of the stew. Gently reheat the braise over medium-low heat until the stock is liquid enough to remove the ribs. Carefully remove the ribs from the sauce and arrange in a baking dish. Preheat the oven to 325°F. 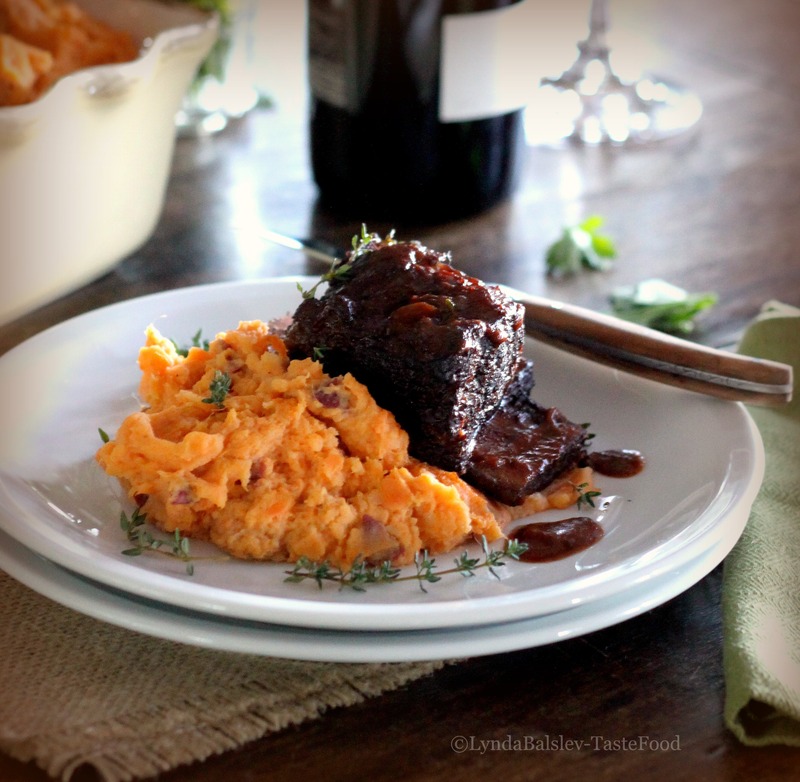 Place the short ribs in the oven and cook until thoroughly heated through, about 30 minutes. Serve with mashed root vegetables or mashed potatoes. 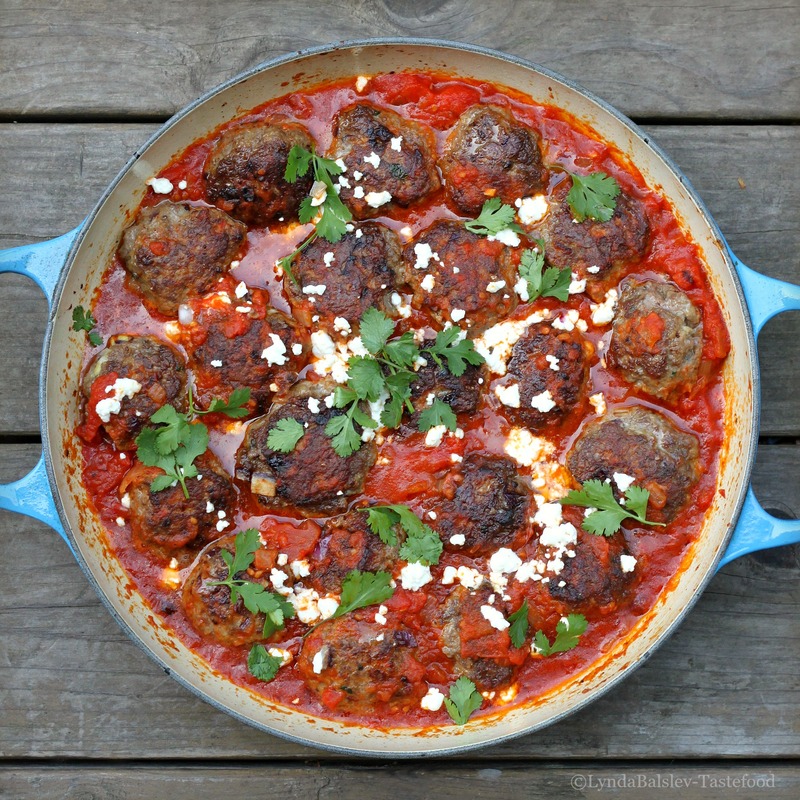 Moroccan lamb kefta meets smothered Italian meatball: Two of my favorite recipes are rolled into one fragrant, warming and satisfying dish. I took my go-to lamb keftas and fluffed them up with breadcrumbs and a nugget of feta nestled in the centers before browning them in a skillet. I then popped them into the oven to braise and finish cooking in a blanket of my roasted tomato-pepper sauce. 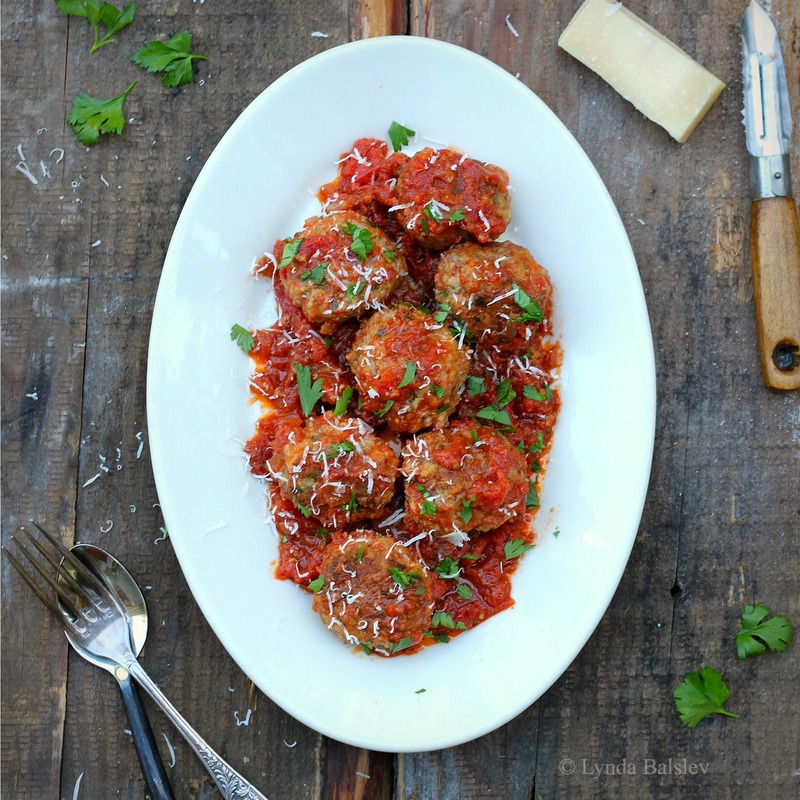 Just like Italian meatballs marinara, these lamb meatballs are very comforting, and I dare say even more tasty with the addition of North African spices and heat. 1. Combine all of the meatball ingredients, except the feta, in a bowl. Using your hands, gently mix until the ingredients are evenly distributed. 2. Shape the meat into 1 1/2 inch balls. Make a small indentation in the centers with your thumb and insert a feta cube, then close the meat around it. Place the meatballs on a plate, cover with plastic wrap, and refrigerate for 1 hour. 3. Heat the oven to 350°F. Heat 1 tablespoon oil in a large ovenproof skillet over medium-high heat. Add the meatballs in batches, without overcrowding, and brown on all sides, turning as needed, about 5 minutes. (The meatballs will not be cooked through at this point. They will continue to cook in the sauce.) Transfer to a plate and repeat with the remaining meatballs. 4. Add the sauce to the skillet and cook briefly over medium heat, scraping up any brown bits in the pan. Return the meatballs to the skillet and nestle them in the sauce, turning to coat. Transfer the skillet to the oven and cook until the meatballs are thoroughly cooked through, about 30 minutes. During the last 5 minutes of cooking time, sprinkle the crumbled feta over the lamb. 5. Serve with couscous or rice and garnish with chopped mint or cilantro. Here is something for your winter dinner rotation: Chunky root vegetables and slow cooked beef swimming in a stock of beef and beer. 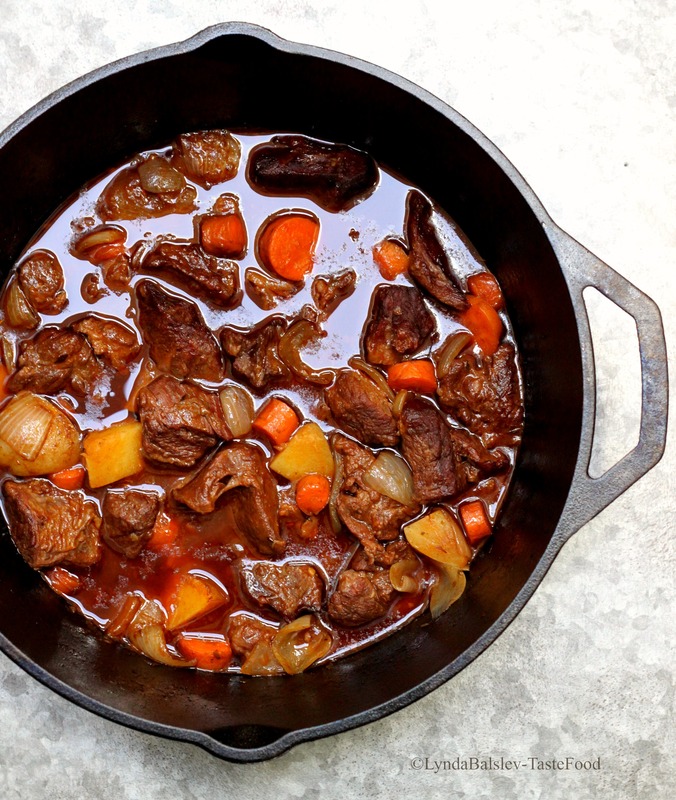 This hearty no-nonsense beef stew is a must have for a dreary winter night. Make a double batch over the weekend, and stretch it out over a few meals. It isn’t fancy, but it’s satisfying and delicious. Consider it a down-to-earth respite between holiday indulgences. The stew tastes even better after a night in the refrigerator. Serves 4 to 6. 1. Preheat the oven to 325°F. Season the beef with salt and pepper. 2. Heat 1 tablespoon oil in a Dutch oven over medium-high heat. Add the beef in batches in one layer, without overcrowding, and brown on all sides. Transfer the meat to a plate and repeat with remaining beef. 3. Pour off all but 1 tablespoon fat from the Dutch oven. Add the garlic and saute over medium heat until fragrant, about 30 seconds. Add 1/2 cup beer to the pot and bring to a boil, scraping up any brown bits with a spoon. When the beer is nearly evaporated, add the tomato paste and cook, stirring, about 1 minute. Return the beef to the pot and stir to coat. 4. Add the stock, 1 cup beer, the bay leaf, sugar, thyme, 1 teaspoon salt, and 1 teaspoon black pepper. The meat should be just covered with liquid. If not, add additional stock to cover. Bring to a boil, then cover the pot and transfer to the oven. Cook until the meat is tender, about 2 hours, stirring occasionally. 5. While the meat is cooking heat 1 tablespoon olive oil in a large skillet over medium heat. Add the carrots and onions and lightly season with salt. Saute until the carrots brighten in color and the vegetables begin to soften, 2 to 3 minutes. 6. Add the carrots, onion, and the potatoes to the stew and stir to combine. Return to the oven and cook, partially covered, until the vegetables are tender and the sauce slightly thickened, about 45 minutes, stirring occasionally. 7. Serve warm ladled into bowls. Next week is summer solstice. For those of you who know me and this blog, Midsummer is a big celebration for our family. Each year we throw a Danish-inspired party at the beach to celebrate the longest day of the year. You can read in great detail about our celebration in this feature I wrote for the June issue of Marin Magazine. This year, however, we are changing gears a bit and heading to the beach a week earlier where we will celebrate Father’s Day. Like the solstice, you can be sure that grilling and a bonfire will be the main attraction – worthy of any Viking (and Dad). On the menu? Grilled baby back pork ribs, thank you very much. They are a hands-down favorite, coated with a sweet and spicy rub that permeates the meat with flavor and heat while cooking long and slow in an oven or on the grill. They are perfect for beach toting, as the ribs can be prepped and cooked early, then transported and thrown on the grill just before eating to caramelize and crisp. These ribs are great as is, with a crispy coating and succulent meat. If you like your ribs more wet, baste with your favorite sauce just before removing from the grill and serve with additional sauce on the side. Serves 6 to 8. 1. 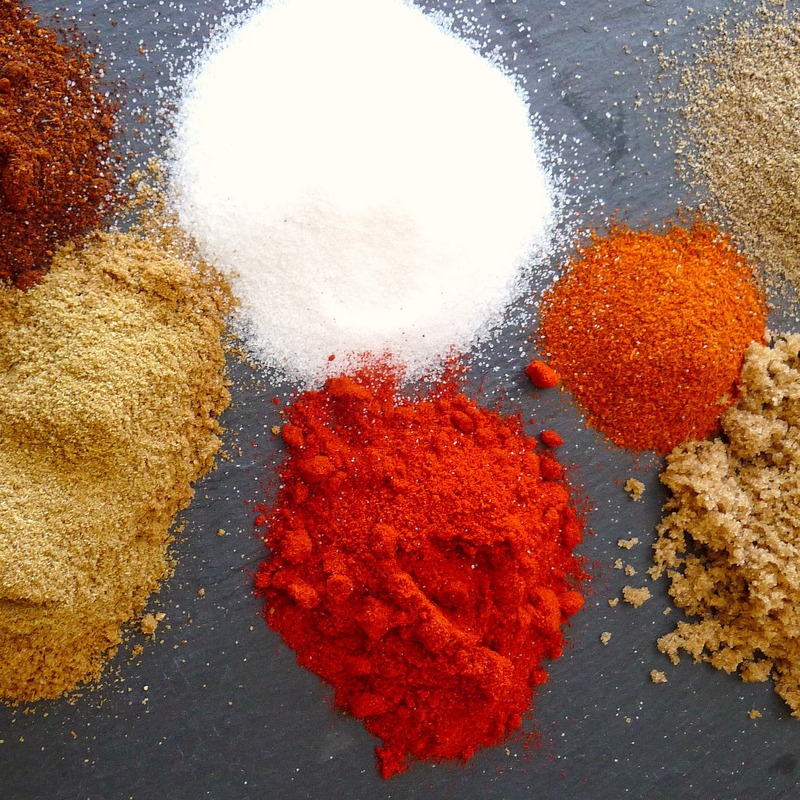 Preheat the oven to 200° F. Combine all of the rub ingredients together in a bowl and mix well. 2. Pat the ribs dry with a paper towel. Arrange in one layer on 2 rimmed baking sheets. Rub the spices all over the ribs on both sides, coating well. Bake in the oven for 3 hours. 3. Prepare a grill for direct medium heat. Grill ribs on a rack over direct heat, turning, until the meat darkens and crisps, 10 to 12 minutes.